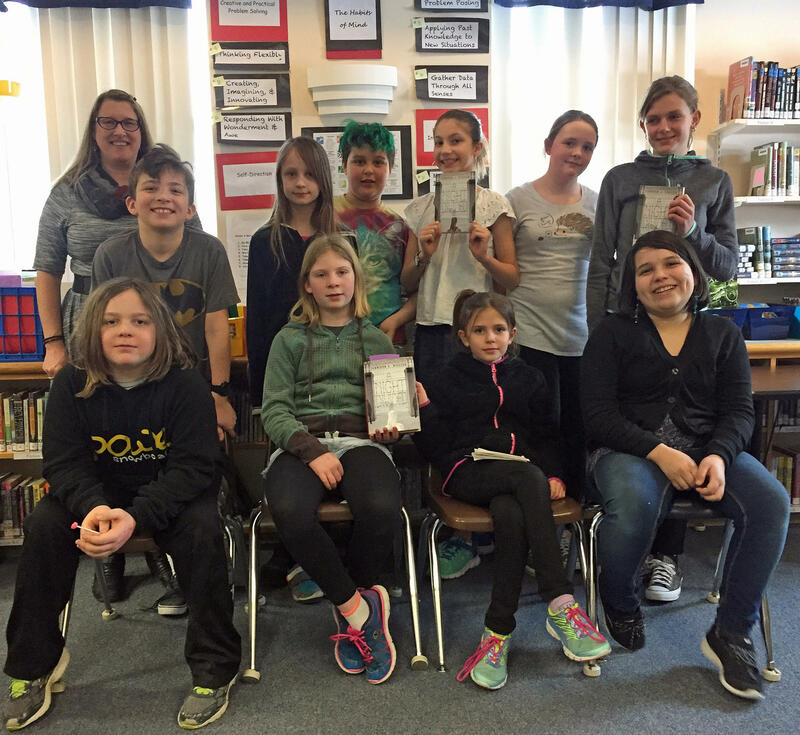 Dorothy's List readers at Waterville Elementary School learned about life behind the Berlin Wall while reading 'A Night Divided' by Jennifer Nielsen. "She was thinking flexibly," observed fifth grader Lila Marinace. "She didn't really know that there was going to be a wall getting put up in the middle of the night. So, she had to think flexibly on how to work around the wall and to get to the other side." One night, while Gerta's father and brother are visiting West Germany, the East German government puts up a barbed-wire fence, dividing the two halves of the city of Berlin. It also divides Gerta's family. That fence is quickly replaced by the Berlin Wall. And Gerta, her oldest brother Fritz, her mother and her ailing grandmother are trapped in East Germany, behind the wall and its armed guards. Gerta and Fritz want to risk escaping to West Germany, where they would be free. But their mother doesn't want to leave her home, and her own mother, behind. So the kids have to come up with a plan without her help. Dorothy's List readers at Waterville Elementary have some questions for author Jennifer Nielsen, who wrote A Night Divided. Dorothy's List readers at Waterville Elementary pose in the school library. Back row, left to right: Library Media Specialist Robin Bryce, Dane Osborn, Cora Chivington, Addison Hineman, Bailey Osborn, Kayley Selig and Greta Pahl. Front row, left to right: Marley Begins, Lila Marinace, Eva Pahl and Lizzie Miller. Dane Osborn: How did you come up with their escape for the book? Jennifer Nielsen: Well, Dane, what I did is I took a big map of Germany and I laid it out on my table and I drew the line where the Berlin Wall would have been. And then I just sat back and I thought, 'No, really, how would you escape this?' And I started looking at all of the obstacles and all of the things that went wrong. And I wanted to do something that felt a little different than what you might have seen before, but something that was also really believable. And so I'm not going to give away their method of escape here on this show, but I will tell you that there were other people who tried similar ways of escaping. And some of them were successful and some of them were just catastrophic failures. So I knew, if they got away with this, it was still going to be a bit of a miracle for them to succeed. Kayley Selig: What made you want to write about the Berlin Wall? Greta Pahl: How do you come up with characters? Jennifer Nielsen: So Greta, the way that characters come to me is when I have the story idea, I don't rush to go find the characters. I want to sit with the story a little bit and kind of figure out in this world that I'm building, who would be the most interesting and exciting characters to introduce to this world? So I started with Gerta … And then every character I build after that is either to help Gerta, such as Fritz and her father, or it's going to be a character that gets in Gerta's way, like Officer Müller or even Gerta's mother. And so all of those characters are there to help her or to interfere with her. And the characters that help her add to her strengths or compensate for her weaknesses. And all the characters who get in her way are just to raise the level of danger that she is in. 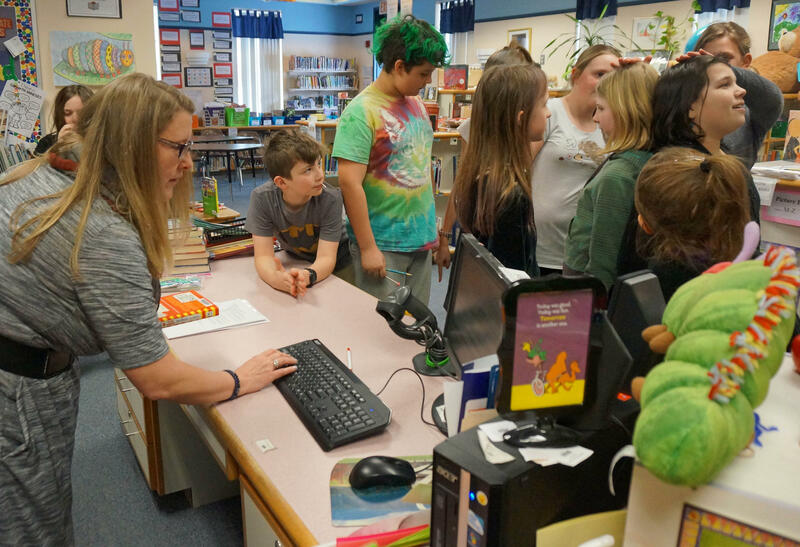 Book checkout is a busy time at the Waterville Elementary School library! Eva Pahl: What made you want to write this book? Jennifer Nielsen: When I had the idea for A Night Divided, my first thought was 'I'm not going to write this. I don't write historical books. I write fantasy books.' And so I had no intention of writing this. So I started looking around for other books I could read. I wanted a book for someone about your age that I could just read and enjoy. And I was stunned – there were no books about it. I found some nonfiction books; I found some books for people who were older, but nothing for your age. And I thought, 'How is that possible that we have not told the story of the Berlin Wall to young readers?' And that was just so amazing to me because here is this time, that wasn't very long ago, in which an entire people were imprisoned behind a wall for no crime other than the zip code to which they were born. Some of the students in Waterville say reading about the Berlin Wall reminded them of something they've been hearing about in the news – the wall President Donald Trump plans to build along the Mexican border. While they don't all agree what a wall in this country might mean, learning about the Berlin Wall has these readers paying attention.